1 A None No Power Seat 1 A is a standard First Class Bulkhead seat. There is no floor storage for this seat during take-off or landing. 1 D None No Power Seat 1 D is a standard First Class Bulkhead seat. There is no floor storage for this seat during take-off or landing. 1 H None No Power Seat 1 H is a standard First Class Bulkhead seat. There is no floor storage for this seat during take-off or landing. 1 L None No Power Seat 1 L is a standard First Class Bulkhead seat. There is no floor storage for this seat during take-off or landing. 11 A None No Power Seat 11 A is a Business Class Exit Row seat with extra legroom. However, the close proximity to the bar, galleys, and lavatories may be bothersome. There is no floor storage for this seat during take-off or landing. 11 C None No Power Seat 11 C is a Business Class Exit Row seat with extra legroom. However, the close proximity to the bar, galleys, and lavatories may be bothersome. There is no floor storage for this seat during take-off or landing. 11 D None No Power Seat 11 D is a Business Class Exit Row seat with extra legroom. However, the close proximity to the bar, galleys, and lavatories may be bothersome. There is no floor storage for this seat during take-off or landing. 11 H None No Power Seat 11 H is a Business Class Exit Row seat with extra legroom. However, the close proximity to the bar, galleys, and lavatories may be bothersome. There is no floor storage for this seat during take-off or landing. 11 J None No Power Seat 11 J is a Business Class Exit Row seat with extra legroom. However, the close proximity to the bar, galleys, and lavatories may be bothersome. There is no floor storage for this seat during take-off or landing. 11 L None No Power Seat 11 L is a Business Class Exit Row seat with extra legroom. However, the close proximity to the bar, galleys, and lavatories may be bothersome. There is no floor storage for this seat during take-off or landing. 13 J None No Power Seat 13 J is a standard Business Class seat. 16 H None No Power Seat 16 H is a standard Business Class seat. 16 J None No Power Seat 16 J is a standard Business Class seat. 17 A None No Power Seat 17 A is a Business Class seat where the noise from the more crowded Economy Class cabin may be bothersome. 17 C None No Power Seat 17 C is a Business Class seat where the noise from the more crowded Economy Class cabin may be bothersome. 17 D None No Power Seat 17 D is a Business Class seat where the noise from the more crowded Economy Class cabin may be bothersome. 17 H None No Power Seat 17 H is a Business Class seat where the noise from the more crowded Economy Class cabin may be bothersome. 17 J None No Power Seat 17 J is a Business Class seat where the noise from the more crowded Economy Class cabin may be bothersome. 17 L None No Power Seat 17 L is a Business Class seat where the noise from the more crowded Economy Class cabin may be bothersome. 2 A None No Power Seat 2 A is a First Class seat where the close proximity to the lavatories, galleys, and closet may be bothersome. 2 D None No Power Seat 2 D is a First Class seat where the close proximity to the lavatories, galleys, and closet may be bothersome. 2 H None No Power Seat 2 H is a First Class seat where the close proximity to the lavatories, galleys, and closet may be bothersome. 2 L None No Power Seat 2 L is a First Class seat where the close proximity to the lavatories, galleys, and closet may be bothersome. 31 A None No Power Seat 31 A is a standard Economy Class Bulkhead seat. The tray tables and TVs are the armrest, making the armrest immovable and slightly reducing seat width. There is no floor storage for this seat during take-off or landing. 31 B None No Power Seat 31 B is a standard Economy Class Bulkhead seat. The tray tables and TVs are the armrest, making the armrest immovable and slightly reducing seat width. There is no floor storage for this seat during take-off or landing. 31 C None No Power Seat 31 C is a standard Economy Class Bulkhead seat. The tray tables and TVs are the armrest, making the armrest immovable and slightly reducing seat width. There is no floor storage for this seat during take-off or landing. 31 D None No Power Seat 31 D is a standard Economy Class Bulkhead seat. The tray tables and TVs are the armrest, making the armrest immovable and slightly reducing seat width. There is no floor storage for this seat during take-off or landing. 31 E None No Power Seat 31 E is a standard Economy Class Bulkhead seat. The tray tables and TVs are the armrest, making the armrest immovable and slightly reducing seat width. There is no floor storage for this seat during take-off or landing. 31 H None No Power Seat 31 H is a standard Economy Class Bulkhead seat. The tray tables and TVs are the armrest, making the armrest immovable and slightly reducing seat width. There is no floor storage for this seat during take-off or landing. 31 J None No Power Seat 31 J is a standard Economy Class Bulkhead seat. The tray tables and TVs are the armrest, making the armrest immovable and slightly reducing seat width. There is no floor storage for this seat during take-off or landing. 31 K None No Power Seat 31 K is a standard Economy Class Bulkhead seat. The tray tables and TVs are the armrest, making the armrest immovable and slightly reducing seat width. There is no floor storage for this seat during take-off or landing. 31 L None No Power Seat 31 L is a standard Economy Class Bulkhead seat. The tray tables and TVs are the armrest, making the armrest immovable and slightly reducing seat width. There is no floor storage for this seat during take-off or landing. 33 A None No Power Seat 33 A is an Economy Class seat that may have limited recline. The close proximity to the lavatories may be bothersome. 33 C None No Power Seat 33 C is an Economy Class seat that may have limited recline. The close proximity to the lavatories may be bothersome. 33 D None No Power Seat 33 D is an Economy Class seat that may have limited recline. The close proximity to the lavatories may be bothersome. 33 E None No Power Seat 33 E is an Economy Class seat that may have limited recline. The close proximity to the lavatories may be bothersome. 33 H None No Power Seat 33 H is an Economy Class seat that may have limited recline. The close proximity to the lavatories may be bothersome. 33 J None No Power Seat 33 J is an Economy Class seat that may have limited recline. The close proximity to the lavatories may be bothersome. 33 L None No Power Seat 33 L is an Economy Class seat that may have limited recline. The close proximity to the lavatories may be bothersome. 34 A None No Power Seat 34 A is an Economy Class Exit Row seat with extra legroom. However, the close proximity to the lavatories may be bothersome. The tray tables and TVs are the armrest, making the armrest immovable and slightly reducing seat width. There is no floor storage for this seat during take-off or landing. 34 B None No Power Seat 34 B is an Economy Class Exit Row seat with extra legroom. However, the close proximity to the lavatories may be bothersome. The tray tables and TVs are the armrest, making the armrest immovable and slightly reducing seat width. There is no floor storage for this seat during take-off or landing. 34 C None No Power Seat 34 C is an Economy Class Exit Row seat with extra legroom. However, the close proximity to the lavatories may be bothersome. The tray tables and TVs are the armrest, making the armrest immovable and slightly reducing seat width. There is no floor storage for this seat during take-off or landing. 34 D None No Power Seat 34 D is an Economy Class Exit Row seat with extra legroom. However, the close proximity to the lavatories may be bothersome. The tray tables and TVs are the armrest, making the armrest immovable and slightly reducing seat width. There is no floor storage for this seat during take-off or landing. 34 E None No Power Seat 34 E is an Economy Class Exit Row seat with extra legroom. However, the close proximity to the lavatories may be bothersome. The tray tables and TVs are the armrest, making the armrest immovable and slightly reducing seat width. There is no floor storage for this seat during take-off or landing. 34 H None No Power Seat 34 H is an Economy Class Exit Row seat with extra legroom. However, the close proximity to the lavatories may be bothersome. The tray tables and TVs are the armrest, making the armrest immovable and slightly reducing seat width. There is no floor storage for this seat during take-off or landing. 34 J None No Power Seat 34 J is an Economy Class Exit Row seat with extra legroom. However, the close proximity to the lavatories may be bothersome. The tray tables and TVs are the armrest, making the armrest immovable and slightly reducing seat width. There is no floor storage for this seat during take-off or landing. 34 K None No Power Seat 34 K is an Economy Class Exit Row seat with extra legroom. However, the close proximity to the lavatories may be bothersome. The tray tables and TVs are the armrest, making the armrest immovable and slightly reducing seat width. There is no floor storage for this seat during take-off or landing. 34 L None No Power Seat 34 L is an Economy Class Exit Row seat with extra legroom. However, the close proximity to the lavatories may be bothersome. The tray tables and TVs are the armrest, making the armrest immovable and slightly reducing seat width. There is no floor storage for this seat during take-off or landing. 46 A None No Power Seat 46 A is an Economy Class seat where the close proximity to the lavatories and galleys may be bothersome. 46 B None No Power Seat 46 B is an Economy Class seat where the close proximity to the lavatories and galleys may be bothersome. 46 C None No Power Seat 46 C is an Economy Class seat where the close proximity to the lavatories and galleys may be bothersome. 46 D None No Power Seat 46 D is an Economy Class seat where the close proximity to the lavatories and galleys may be bothersome. 46 E None No Power Seat 46 E is an Economy Class seat where the close proximity to the lavatories and galleys may be bothersome. 46 H None No Power Seat 46 H is an Economy Class seat where the close proximity to the lavatories and galleys may be bothersome. 46 J None No Power Seat 46 J is an Economy Class seat where the close proximity to the lavatories and galleys may be bothersome. 46 K None No Power Seat 46 K is an Economy Class seat where the close proximity to the lavatories and galleys may be bothersome. 46 L None No Power Seat 46 L is an Economy Class seat where the close proximity to the lavatories and galleys may be bothersome. 47 A None No Power Seat 47 A is an Economy Class Exit Row seat with extra legroom. However, the close proximity to the lavatories and galleys may be bothersome. The tray tables and TVs are the armrest, making the armrest immovable and slightly reducing seat width. There is no floor storage for this seat during take-off or landing. 47 B None No Power Seat 47 B is an Economy Class Exit Row seat with extra legroom. However, the close proximity to the lavatories and galleys may be bothersome. The tray tables and TVs are the armrest, making the armrest immovable and slightly reducing seat width. There is no floor storage for this seat during take-off or landing. 47 C None No Power Seat 47 C is an Economy Class Exit Row seat with extra legroom. However, the close proximity to the lavatories and galleys may be bothersome. The tray tables and TVs are the armrest, making the armrest immovable and slightly reducing seat width. There is no floor storage for this seat during take-off or landing. 47 J None No Power Seat 47 J is an Economy Class Exit Row seat with extra legroom. However, the close proximity to the lavatories and galleys may be bothersome. The tray tables and TVs are the armrest, making the armrest immovable and slightly reducing seat width. There is no floor storage for this seat during take-off or landing. 47 K None No Power Seat 47 K is an Economy Class Exit Row seat with extra legroom. However, the close proximity to the lavatories and galleys may be bothersome. The tray tables and TVs are the armrest, making the armrest immovable and slightly reducing seat width. There is no floor storage for this seat during take-off or landing. 47 L None No Power Seat 47 L is an Economy Class Exit Row seat with extra legroom. However, the close proximity to the lavatories and galleys may be bothersome. The tray tables and TVs are the armrest, making the armrest immovable and slightly reducing seat width. There is no floor storage for this seat during take-off or landing. 48 D None No Power Seat 48 D is an Economy Class Exit Row seat with extra legroom. However, the close proximity to the lavatories and galleys may be bothersome. The tray tables and TVs are the armrest, making the armrest immovable and slightly reducing seat width. There is no floor storage for this seat during take-off or landing. 48 E None No Power Seat 48 E is an Economy Class Exit Row seat with extra legroom. However, the close proximity to the lavatories and galleys may be bothersome. The tray tables and TVs are the armrest, making the armrest immovable and slightly reducing seat width. There is no floor storage for this seat during take-off or landing. 48 H None No Power Seat 48 H is an Economy Class Exit Row seat with extra legroom. However, the close proximity to the lavatories and galleys may be bothersome. The tray tables and TVs are the armrest, making the armrest immovable and slightly reducing seat width. There is no floor storage for this seat during take-off or landing. 58 C None No Power Seat 58 C is an Economy Class seat that is often bumped into by passengers and crew members due to the awkward configuration change from 3 to 2 seats. 58 J None No Power Seat 58 J is an Economy Class seat that is often bumped into by passengers and crew members due to the awkward configuration change from 3 to 2 seats. 59 A None No Power Seat 59 A is an Economy Class seat that may have restricted legroom due to the misalignment with the seats ahead. Couples often enjoy sitting in this row as it is one of the one twosomes on the plane. 59 C None No Power Seat 59 C is an Economy Class seat that may have restricted legroom due to the misalignment with the seats ahead. Couples often enjoy sitting in this row as it is one of the one twosomes on the plane. 59 J None No Power Seat 59 J is an Economy Class seat that may have restricted legroom due to the misalignment with the seats ahead. Couples often enjoy sitting in this row as it is one of the one twosomes on the plane. 59 L None No Power Seat 59 L is an Economy Class seat that may have restricted legroom due to the misalignment with the seats ahead. Couples often enjoy sitting in this row as it is one of the one twosomes on the plane. 60 A None No Power Seat 60 A is an Economy Class seat in the last row of the plane that may have limited recline. The close proximity to the lavatory and galleys may be bothersome. Couples often enjoy sitting in this row as it is one of the one twosomes on the plane. 60 C None No Power Seat 60 C is an Economy Class seat in the last row of the plane that may have limited recline. The close proximity to the lavatory and galleys may be bothersome. Couples often enjoy sitting in this row as it is one of the one twosomes on the plane. 60 D None No Power Seat 60 D is an Economy Class seat in the last row of the plane that may have limited recline. The close proximity to the lavatory and galleys may be bothersome. Couples often enjoy sitting in this row as it is one of the one twosomes on the plane. 60 E None No Power Seat 60 E is an Economy Class seat in the last row of the plane that may have limited recline. The close proximity to the lavatory and galleys may be bothersome. Couples often enjoy sitting in this row as it is one of the one twosomes on the plane. 60 H None No Power Seat 60 H is an Economy Class seat in the last row of the plane that may have limited recline. The close proximity to the lavatory and galleys may be bothersome. Couples often enjoy sitting in this row as it is one of the one twosomes on the plane. 60 J None No Power Seat 60 J is an Economy Class seat in the last row of the plane that may have limited recline. The close proximity to the lavatory and galleys may be bothersome. Couples often enjoy sitting in this row as it is one of the one twosomes on the plane. 60 L None No Power Seat 60 L is an Economy Class seat in the last row of the plane that may have limited recline. The close proximity to the lavatory and galleys may be bothersome. Couples often enjoy sitting in this row as it is one of the one twosomes on the plane. All seats have Thales AVOD personal screens with a wide variety of music and audio options. 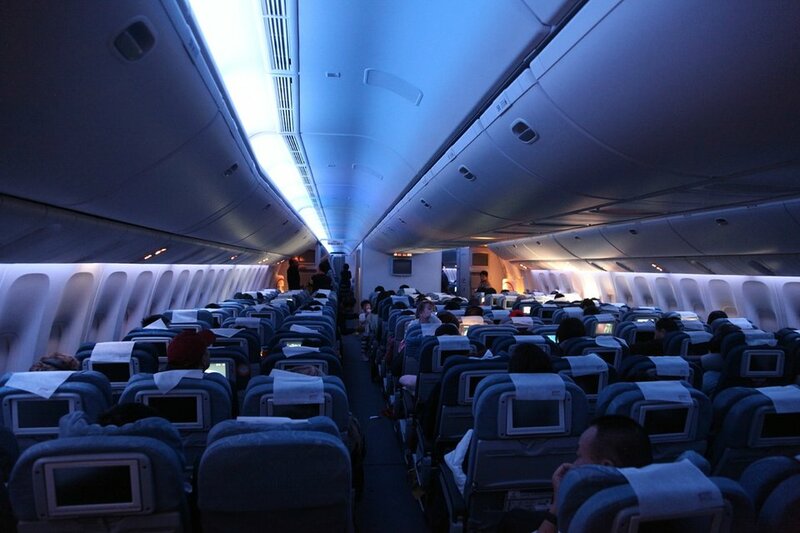 Screens are 23 inches wide in First Class, 15.4 inches wide in Business class, and 9 inches wide in Economy Class. All seats have Thales AVOD personal screens with a wide variety of television, movie, and other video entertainment options. 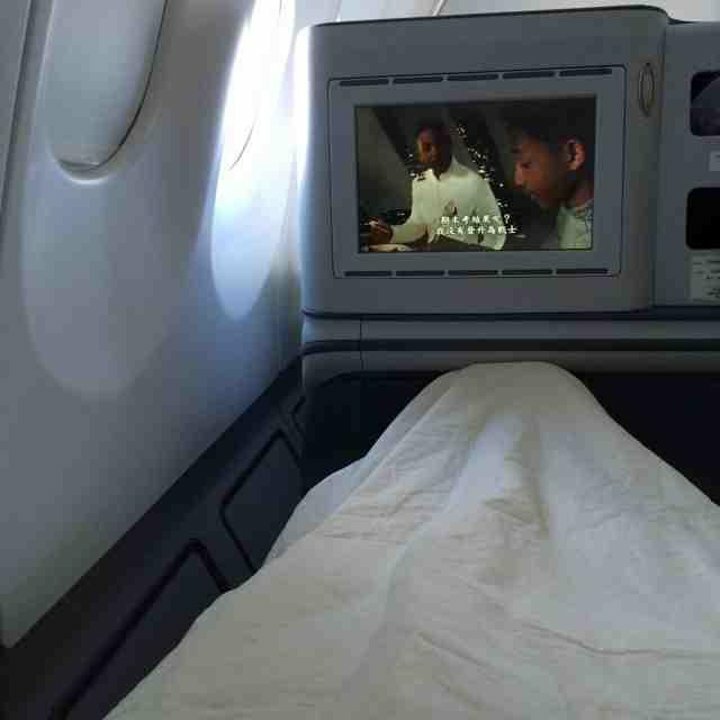 Screens are 23 inches wide in First Class, 15.4 inches wide in Business class, and 9 inches wide in Economy Class. All classes have AC power outlets. Business and First class have 1 outlet per seat, while Economy Class has 2 outlets per 3 seats. This aircraft offers free WiFi for all classes. 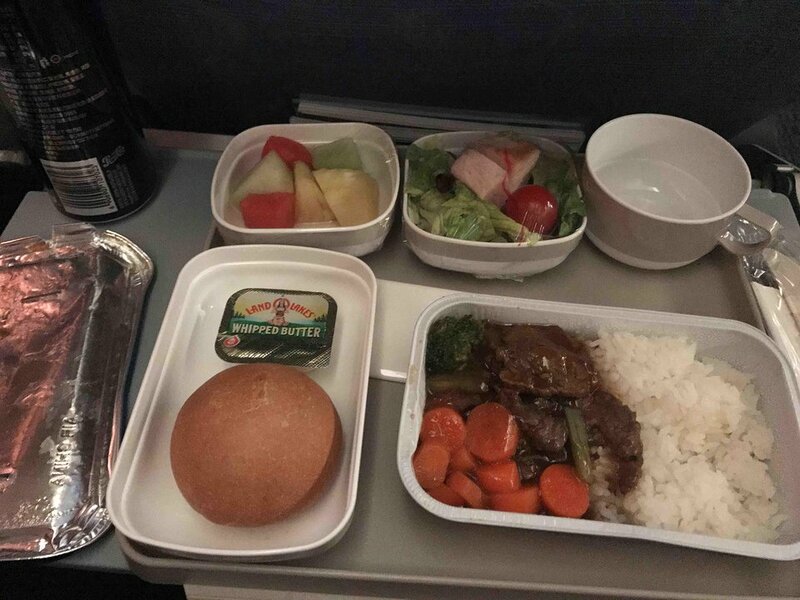 Air China offers complementary meals, snacks, and beverages on medium-long-haul flights. This Boeing 777-300ER features 311 seats in a 3-class configuration. There are 8 seats in First Class, 42 seats in Business Class, and 261 seats in Economy Class. First Class features Mercury lie flat seats while Business Class features Diamon lie flat seats. Most A, B, D, H, K, and L seats in Economy Class have entertainment boxes beneath the seat in front, restricting legroom and underseat storage space. The 77W flies on international routes from Beijing to Frankfurt, Los Angeles, and Paris as well as domestic routes from Beijing to Shanghai, Guangzhou, Shenzhen and Chengdu. The 777W will be replacing the Boeing 740-400 on routes to the US. Comfortable seating. No other passengers behind. Only 2 passengers in the section so less passenger coming in and out. The seat has LARGER leg room as it is directly behind 58K and there is NO seat on the left. So you can put your leg to the left. PEK-LAX. Traveled with my parents and they sat on 13J/L. It's been a while since I last flied Air China long haul. As I recall their A330-200s had better business class seats with all ailse access and I did hate these B777-300ER buz seats since they switched to this aircraft back a few years ago. Generally speaking, these seats themselves and the flight experiences were ok. Comfortable seat/bed and good variety of food and drink. Flight attendants were nice and attentive enough. Good value for money when time is right, although not as great as some international carriers like Lufthansa, etc. Seat 33C was a joy to sit in. You essentially can stretch out to your right as there is nobody there and you dont really have to get up everytime one person wants out. The inflight screen was ok, luckily I understand some chinese so i was able to switch the language to english. the movie selection was ok but nothing special (delta has way better options). i only ate one of the meals and it was pretty bad not going to lie. The pasta salad was ok. This 12.5 hour flight couldve been a lot worse. These seats typically line up with the A/B seats in the forward row. 59 gets two windows! There are three total bathrooms in the back as well as the galley. However it was fairly quiet and people free. Seats don't have power or wifi. The plug-in for the seat audio requires using the Air China supplied headphones. Video screens had Chinese and English, numerous movies and TV shows. Meals were psuedo-Chinese. Not too bad, had two dinner meals on the westbound flight. The seat was fine itself, however, this flight nor any of the other 3 Air China flights I took had power outlets or free in-flight wifi. The food like another reviewer said is all Chinese or otherwise Asian which was fine with me. Flight attendants were polite and tried their best to communicate with me in English. The in flight entertainment is completely in Chinese and flight map didn't have option for English so you can view map but all labels will be in Chinese. Nice window seat in coach. Even though last row, the seats do fully recline. Unlike American sardine cans, Air China still has 9-across for their 777 coach sections (versus 10 across), so you get an extra inch both in the seat width and between seat and the cabin wall. Food is...well Chinese, like most passengers. Prices for their flights can be very, very, low, yet they are still full service (2 free bags, beer/wine, etc). Much worse out there, particularly for US carriers. 11A and L is the same. The proximity to galley is not bothersome. The rest room is further away from Galley, closer to First Class. Please note that a window is missing from row 11. Also, there is a new config for Air China B77W. 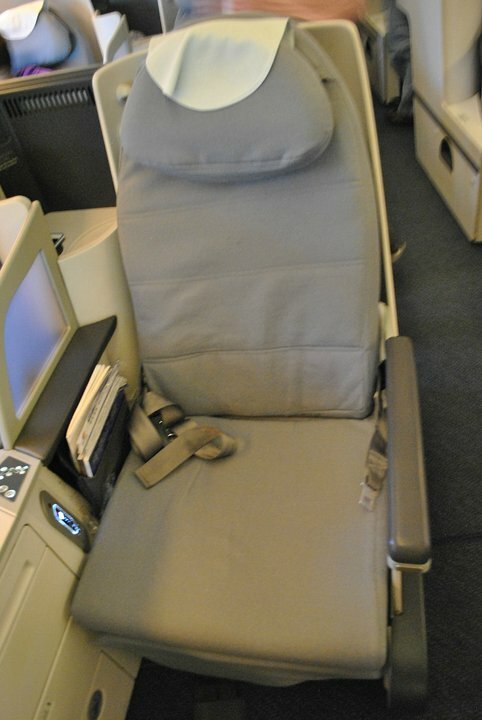 Business Class + 10 seast abreat Premium Econ (extra leg room) + 10 seats abreast economy. Almost 400pax in one plane. Good seats, plenty comfortable and plenty of leg room. Not as spacious as other business class offerings but the price is good. Slept a solid 8 hours without issue. Food and service was good but there wasn't much attention outside of the regular service times. FAs ranged from very little English to being able to speak it well enough for a conversation. Solid seat, wider than most 777W aircraft. Only complaint is the foot rest they have built into the back of the seats which limits the angle you can put your legs if you're tall, probably nice if you're short. Not an incredible flight but would choose it over United any day. 33C/J are definitely some of the best Economy seats on this plane. It's one of the few 2-3-2 rows, so you only have 1 neighbor, the aisle is extra wide and you don't share overhead space with so many people. By having 2 seats in front of you, this provides extra wide legroom. You can fully recline and without people behind you that does not bother anyone. Also, there's some extra storage space behind the seat. The lavatory is close (and sometimes a bit noisy, mostly for seats D/E/H), but most people wait in front of row 34, so there's no problem. The close proximity to the lavatories and galley is not a problem for the entire last row of the first class. The lavatories behind seat 2A and 2L are designated for first class and there are one curtain in between the first class cabin and lavatory and an another one between the lavatory and galley. Was very leery based on previous comments. I found Air China to be no worse or better than most other airlines. Would fly them again anytime. One of the nicest first class cabins I have been in. The seat is wide and the monitor is huge. 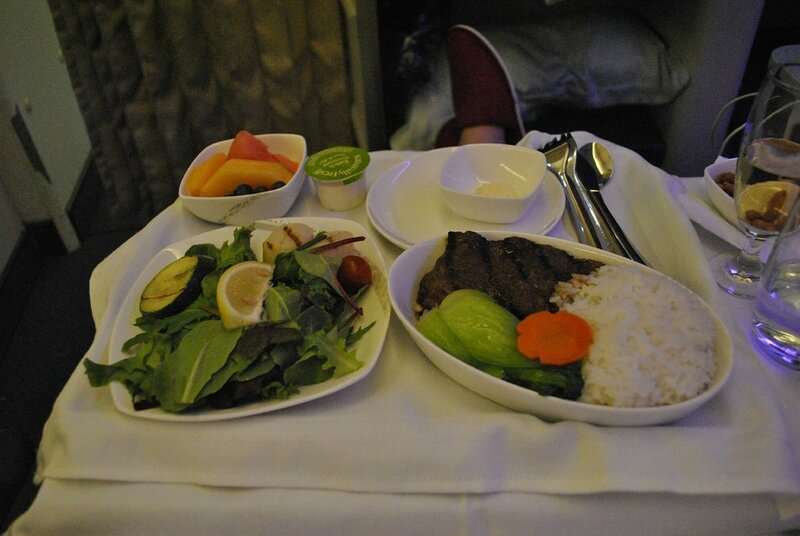 Had my private FA and restaurant style dining all flight long. Beats F cabin on United or AA by miles. Was my first experience with Air China, and i hope is gonna be the last. Seat are confortable, but not really clean. This company is far away from the standard of others vector of the same alliance, like lufthansa for example. they do not offer good quality food or entertainment, and on-board personals are quite rude. Avoid if possible. When you board your plane you get a blanket and a pillow, but not clean ones. They are used. This is shameful. Also no amenity kit on a long haul flight. Food is horrible also. Avoid Air China!!!! It was an ok seat with doucble windows over the wing. Entertainment box wasn't too much of an issue. Air China flies 1 versions of Boeing 777-300ER.